Tyrande Whisperwind has been a central part of the Alliance since way back in vanilla WoW. She was one of the key figures in the events of Warcraft III, and she's had a substantial role in the course of Azeroth as a whole -- she was there at the Sundering, she was there at Mount Hyjal, and as far as we can tell, she'll be around much longer than that. Truthfully, my issues with Tyrande are not as substantial as those I had with King Varian Wrynn. Even in vanilla WoW when nearly every other faction leader sat idle, she was called front and center to cleanse Eranikus in Moonglade. She's active. She's powerful. She's faithful. She's as close to perfect as Alliance faction leaders get. There's only one problem: Malfurion Stormrage. Tyrande is powerful. Most of the faction leaders have been given an opportunity to display the raw strength they possess at one point or another, but Tyrande is one of the best. Every single time she makes a meaningful appearance in World of Warcraft, it's to go up against impossible odds and pull off something crazy. The cleansing of Eranikus was one of the most significant game events around back in classic WoW. In Well of Eternity, the patch 4.3 dungeon, Tyrande almost single-handedly routs the entire Burning Legion (minus Mannoroth himself.) Sure, she calls for help once or twice -- but seriously, this woman wades through an endless flow of demons armed with nothing but her bow, a few arrows, and a whole lot of faith. The fact that she only briefly calls for assistance when she's been locked down by a pair of nathrezim is incredible. Nobody thinks about her role in the instance, though. The display of strength she pulls off there is immediately forgotten about. One of the reasons for that is everything she does occurs in the background. You miss what she's doing because you're busy paying attention to Varo'then and Mannoroth, not the legion of demons she's keeping off of your back. Another reason you don't think about it is because ... Malfurion Stormrage himself completely marginalizes her significance. He outright tells her to stop talking. When the NPCs dismiss someone's contributions wholesale so easily, it's difficult for players to do any different. 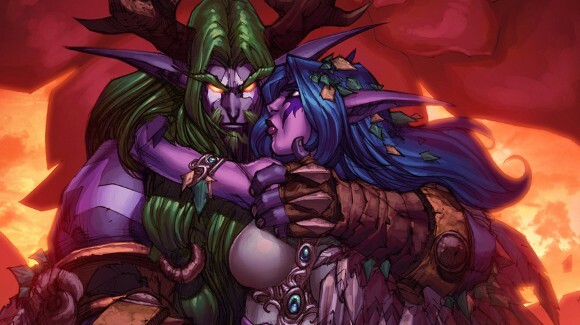 Malfurion's dismissal of her -- Hush, Tyrande -- sums up their entire relationship. Tyrande, a powerful and dangerous woman, is instantly backseated the moment her beloved beau shows up on the scene. Hush, Tyrande. Go have a seat. Malfurion is talking now. The first step toward solving this problem: stop marginalizing Tyrande. She is a fantastic, compelling character. 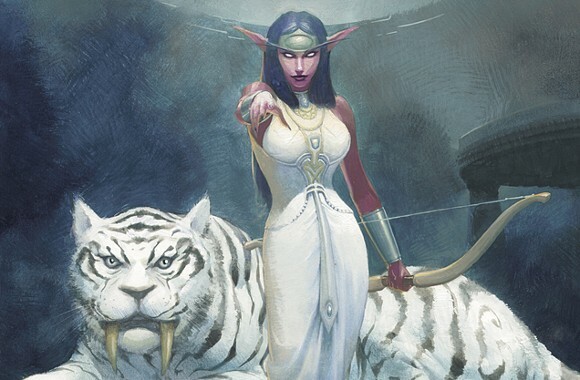 This is a woman who has led her people for over 10,000 years, and she did it without Malfurion while he was off having adventures in the Emerald Dream. She has the direct blessing of her goddess. When Tyrande calls on Elune, Elune listens. That concept by itself is terrifying. Who else in the World of Warcraft has the direct blessing of a goddess? Who can ask their deity to intervene and that deity actually does it? The Light comes close, but we sure as heck haven't seen the Light pull off the crazy stunts Tyrande has done with Elune at her side. Give this woman some time in the spotlight. 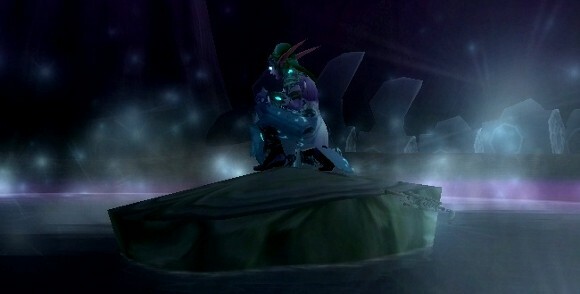 The End Time actually did a great job of showing off Tyrande's character. Sylvanas, Baine, and Jaina were all cool encounters, but absolutely none of them exemplified the essence of their character better than Tyrande. Even all alone, standing as the lone light in the darkness, she did not lose her faith. She did not lose her way. With her dying breath, she still entrusted herself to her goddess. Now let's see her do that in a scenario where we're not stabbing her to death. To be blunt: Tyrande needs to get away from Malfurion. They don't need to divorce or have a falling out; just keep some physical distance between them. Don't put them into play as a unit. Tyrande is a guardian of her people. Malfurion ... is not. Malfurion has never been a member of the Alliance. If there were ever a true neutral character in Warcraft, it would be him. Not Thrall, who has spent the better part of his adult life building the Horde and furthering its goals. It's Malfurion, who has never given a damn about the Alliance or its continued existence. Heck, Malfurion doesn't even always support his own species. He often chooses a role that is not to the benefit of his people at all. He has made massive, catastrophic sacrifices for his race as a whole -- the night elves' loss of their Aspect-given immortality was caused by a decision that he alone made. Malfurion, fittingly, is a force of nature in that way. His decisions are not meant to aid his people. They're not meant to further the Alliance. They're meant to guarantee the continued existence of the natural world, bipedal humanoids of any variety be damned. If many people die in the process, so be it. He makes a massive decision, changes the world in irreversable ways, and leaves someone else behind to pick up the pieces -- people like Fandral Staghlem and Leyara, who were crushed beneath the enormity of what Malfurion put into play. Malfurion himself has never dealt with the repercussions of his actions. Malfurion was not there when the Alliance was formed. Malfurion was not there for the last decade or so of not-so-cold war between the factions. Hell, the night elves weren't even in the picture when the orcs and the humans were at each other's throats for decades before that. At no point in time has Malfurion Stormrage played a role in this war. When he finally returns to reality after his escapades in the Emerald Dream, does Malfurion help his people fight back against Garrosh's Horde, which is so gleefully slashing and burning the forests of Kalimdor and slaughtering the night elven people? Malfurion has no interest in it. He goes to Hyjal, makes friends with the exact same Horde that is culling his people, then preaches about petty differences and greater goods right to the faces of the those who have lost friends and family at the hands of orcs. Put yourself in Leyara's shoes for a moment. Leyara's daughter is killed at the hands of orcs. She grieves. She wants to know why Malfurion won't do something about the Horde, why he won't help, why he stands idly by while they cause so much pain. Malfurion points to her daughter's murderer and says, "This cold-blooded murderer isn't that bad when you really think about it, you know? It could be worse, right? Justice is so overrated." If Malfurion is going to continue in his unwavering neutrality, we can't have a Tyrande and Malfurion who operate as a unit. Tyrande needs to be a guardian of her people. She needs to fight back against Garrosh's aggression. Fandral Staghelm and Leyara should have never reached a point where they need to wonder why their leadership isn't acting. The fact that they decided their only recourse was to drown the world in flames should be a wakeup call. Don't blame Leyara. Don't blame the victim. Blame the orcs for the bloodshed. Blame Malfurion for letting it happen and dismissing it. The night elves cannot rely on Stormrage. They don't need to rely on him. Send Malfurion Stormrage off to Moonglade. Forget him as a part of the Alliance. He is as neutral as neutral gets, and changing that now would only serve to make him look like a blind, stupid fool. Oh, so now you want to fight the Horde? No. Get him out of Darnassus. Play him up as a force of nature who simply does not care who is at war with who as long as Azeroth itself survives. As for Tyrande, keep her as an integral figure within the Alliance. She should never defer to Malfurion when it comes to political matters, especially in war time. Build her up as the leader of her people, not Malfurion. She has strength. She has faith. Let her wield the wrath of her goddess against those who would harm the sons and daughters of the moon. Where Malfurion looks at people like Leyara and tells them Get over it, Tyrande should look at Leyara and say I will not allow this to happen again. With Malfurion out of the picture, Tyrande given clear leadership of her people, and Varian Wrynn recovered from his rampant alcoholism, the Alliance would have a solid foundation on which to begin rebuilding. High King Varian Wrynn and High Priestess Tyrande Whisperwind as the founding members of the Alliance's new war council? Hell, yes.